This completely DIGITAL unit introduces debate to upper elementary/middle school students. Within the product, students learn the ins and outs of debates and also prepare for in-class debates. 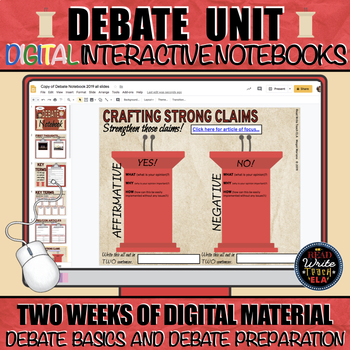 ONE digital interactive notebook for students to learn the basics of debate. 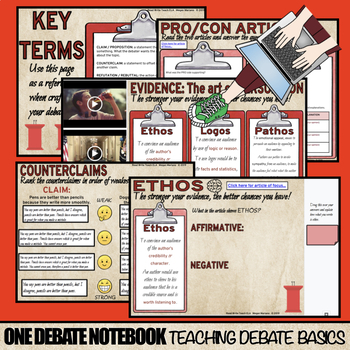 Within the notebook, students manipulate various elements to focus on key terms of debate (ethos, pathos, logos, counterclaims, rebuttals, and more). Video clips are provided of actual debates and use of ethos, logos, and pathos. Additionally, Newsela articles are included to analyze argumentative writing. 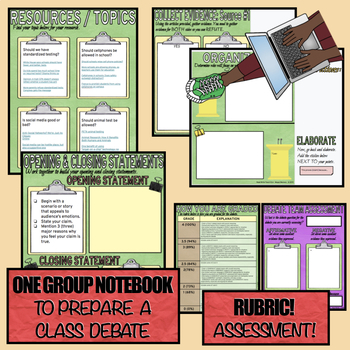 ONE digital interactive notebook for students to work in groups to prepare for debates. Four topics are given with articles pulled from free subscriptions to reading websites (Newsela, Readworks, and Commonlit). Students use the articles provided to gather and organize evidence in this shared notebook with their peers. Then, they get to have a debate in class! ONE assessment Slide for students to assess their peers during debates. A rubric for grading debates. My 6th graders LOVED this unit. It's a great precursor to argumentative essay writing.